Ticket sales for New York Comic Con—the largest pop-culture convention on the East Coast—went on sale at noon yesterday, and resembling last year's cluster****, thousands of fans jammed the servers and landed on error pages after waiting in the virtual queue for over an hour, with many buyers reportedly kicked off before completing their purchase. According to Lance Fensterman, ReedPOP's Global VP, ticket demands for this year's New York Comic Con roughly quadrupled from 2014, making the amount of individuals waiting in the virtual queue when it opened outnumber the amount of VIP, 3-Day, 4-Day, and Saturday tickets combined. To put it into perspective, last year's convention attracted 151,000 fans to the Javits Center—a number that itself was double what it was just five years prior and over four times its inaugural event in 2006. The rapid increase is due primarily to the growing popularity of geek culture in film and television and the transition away from the focus on just comics. The record-number crowd surpassed San Diego Comic Con's 130,000 cap, making NYCC the largest pop-culture convention in North America. With hopes of reaching the height of other New York events such as Fashion Week, ReedPOP expanded its popular convention into a week-long "Super Week" filled with official off-site events that continue to increase the city's economic growth. Unlike years prior where tickets were made available in waves, NYCC released all the tickets at once, putting the demand for tickets under a higher stress. Not surprisingly, it didn't take long for tickets to show up in masses on StubHub and Ebay for over three times the original price, with VIP, 3-Day, and 4-Day passes selling out first. Saturday tickets soon followed suit, as did Kid's Day and then Sunday tickets. Thursday passes are still available, however, and a limited supply will be sold at Special Edition: NYC on June 6 and 7. An event at Midtown Comics—the ONLY retail partner selling tickets—will be announced during the summer, though if it's anything like last year (and it will be), beware; over 1,000 fans camped out for more than 24 hours last year and were met with disorganized lines and no security. Anticipating the heavy traffic, NYCC's official twitter account begged people to stay off their website and instead go directly to ShowClix, but it wasn't enough to handle the overwhelming number of fans scampering for a chance to attend the growing pop-culture convention. Twitter was amass with frustrated fans, some of whom complained about the wait times and error pages, while others provided comical reassurance that we are all in this together. Fensterman issued a statement that included both an apology and explanation that stated, "while that still might not get you the ticket to NYCC that you wanted, we hope it will at least provide you with some portion of the explanation you deserve." Fensterman also acknowledged the major issue with ticket scalpers, stating that they will comb through sites to have tickets removed. Though they further limited the quantity of tickets per purchase and implemented a procedure that reviews the data of ticket purchasers to cross-check names, addresses, emails, and credit cards to ban those attempting to purchase more than the maximum allowed, they still weren't able to prevent hundreds of tickets from landing on resale sites. ReedPOP is urging fans not to buy from scalpers, as they will be "canceling as many of those people we can identify as ticket resellers (meaning those trying to cheat the system and buy large quantities) so you may be buying a worthless piece of paper." 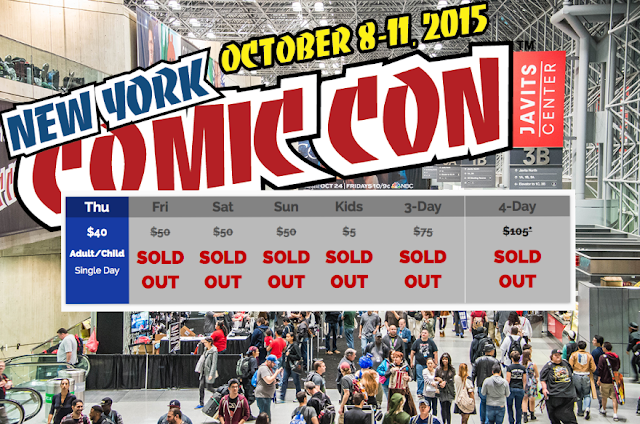 New York Comic Con 2015 will once again fill the Javits Center on October 8–11. Were you able to get your ticket to NYCC? Let us know your ticket buying experience in the comments below.